This is a guest post from reader Brendon Harré. It was originally posted on his Medium blog. Housing exists in a framework of rules and infrastructure provision. Increasingly around the world this framework is being challenged, as the perception has developed that urban development frameworks are only benefiting the few and are detrimental to both the poor and the middle class. New Zealand has been part of this worldwide trend, its new government in response to public opinion has prioritised housing reforms. In the Speech from the Throne, at the opening of parliament, the Governor General read out her new government’s housing plans, there was a strong commitment to removing restrictions in order to build more affordable homes. In the US, there have been a lot of studies and economists advocating for housing reforms and a strong beginning for various housing advocacy groups, in particular YIMBY (Yes in my Backyard) groups have set up in a number of high cost cities -San Francisco, Seattle etc. A few people, such as San Francisco’s Scott Wiener and Sonja Trauss have transitioned from these advocacy groups to becoming elected politicians. So it is possible that a gradual wave of housing reforms will be enacted in the US in the near future. A Washington Post article by Ilya Somin gives a good description of how the liberal left may be reconsidering some aspects of zoning, for example. A changing attitude to zoning restrictions is also affecting the epicentre of restrictive zoning for the last 70 years -London. The UK 1947 Town and Country Act in a sense nationalised developmental rights from all landowners by the then Labour government. This urban development system was reformed, but not abolished, by the Conservative government led by an elderly Winston Churchill in 1951, by removing the accompanying betterment tax (which due to its high rate had virtually stopped all urban development). This ensured the developmental capital gain benefit went to a tightly rationed group of localised landowners, who were fortunate enough to gain developmental rights with monopolistic pricing power from the Town and Country regulatory system. The wider urban land owning group also benefited from large increases in property values as a result of land supply for new housing being more restricted than it could have been. 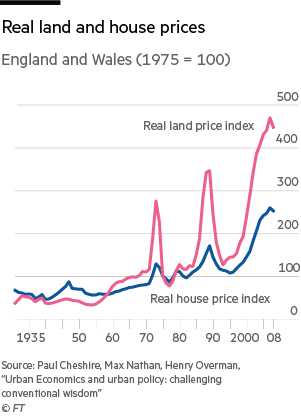 Since the 1950s, house and land prices in England and Wales have boomed and busted, with the overall trend being a rapid escalation of property prices in real (inflation adjusted) terms. The ‘broken planning system’ part of the UK housing story is told in this Financial Times article. I think it misses the point that urban land can be more competitively priced depending on how restrictive or not the planning and infrastructure provision system is, but it is useful to know the historic timeline for how the UK’s urban development system evolved. The benefits accruing to the relatively small group of land bankers have become quite significant over time. The Conservative UK Chancellor (Finance Minister) Phillip Hammond in a recent budget speech threatened to compulsory purchase land to build 300,000 homes a year. This caused the shares of Britain’s main urban land bankers and housebuilders to fall 3% during his half-hour speech. At the local level in London, a ‘Yes in my Backyard’ organisation has formed with the purpose of finding a culturally acceptable formula for removing restrictions on building affordable homes. London Yimby have a well researched report detailing their proposals, titled –Yes in my Backyard, How to end the crisis, boost the economy and win more votes. London Yimby’s main proposal is that individual streets, given a two-thirds majority, should have the automatic right to negotiate themselves the ability to upzone, up to 5–6 stories high, or perhaps an additional 2–3 stories above existing structures, whichever is lower. The resulting street development needing to adhere to a uniform building style also negotiated at the street level. Obviously, London Yimby are strong advocates for removing restrictions on building up. They note that half of London homes are one or two storied housing and they therefore believe that adding more floors is one of the best and most acceptable ways to improve housing supply for the city. 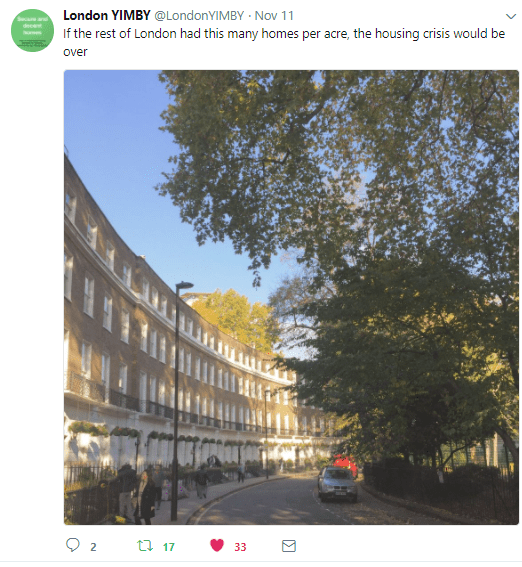 London Yimby are active on twitter and often use photos of London’s streets and houses to make their point. Tokyo is another big metropolis city has managed to nearly triple its residential built space by intensification since 1963. That highlights how London seems to lack an effective intensification mechanism in its urban development regulatory system. It is debateable whether the ability of whole streets to add more floors, under some circumstances, will add enough competition to remove landbankers monopolistic pricing power. Will large numbers of landowners on a street really agree on a single course of densification action? Even if they do, many serious urban planning theorists such as Alain Bertaud, indicate a city’s competitive land supply needs to include mechanisms for making room – both up and out. So London’s Yimby’s proposed new housing supply mechanism may prove insufficient, although in my opinion it is a significant step in the right direction, as it provides London with a intensification mechanism which has been a significant flaw in its planning system for long time. A try and see approach is probably the right way to proceed. The ‘for the many not the few’ concept could also indicate what an effective intensification mechanism might be. I quite like London Yimby’s street by street proposal because it gives upzoning potential to many landowners not just a few. This widespread dispersal of upzoning rights should reduce the ability of individual landowners in desirable locations to extort maximum monopolistic pricing, because neighbouring streets might provide better intensification housing at a lower price. London Yimby’s proposal where streets cooperate to give themselves upzoning rights has some similarities to a proposal of mine where neighbours co-operate to remove setback and shade plane restrictions on their common boundary. I called my idea reciprocal intensification. A number of people have discussed this proposal and it has received some legislative backing. Peter Nunns an economist who writes for Greater Auckland most recently reviewed the idea and described it as legalising perimeter block development. 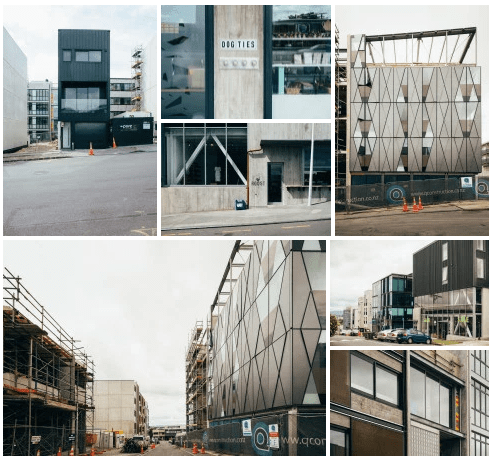 In Auckland there has been a new development utilising the many not the few concept to intensify a 1.3 hectare inner city site which use to be a vinegar factory. The development has been subdivided into 30 free-hold lots, with the buyers free to develop the lots to meet their own needs. For several years I have watched and admired this Auckland development. I especially like that it was inspired by the impressive Dutch development Borneo Sporenburg, which has triggered my thinking on reciprocal intensification. Vinegar Lane was master planned by Isthmus, owners of the 30 freehold lots have been free to select their own architects to design buildings that slot into the urban design framework. Designs are informed by the Vinegar Lane Design Manual which seeks to provide variety within the whole. Each lot is permitted 100% site coverage and a 4 storey (15m) height limit. Resource consents for each lot were pre-approved; leaving detailed designs to pass through the Vinegar Lane Design Review Panel and ACs’ building consent process…. When fully built-out the site will yield a density of 190 dwellings per ha gross (including lanes within the site), or 280 dwellings per ha net. High density mixed-use achieved within a mostly 4-storey height envelope. We believe this ‘kiwi urbanism’ approach can be adopted elsewhere across the city. Such development could increase the density of the inner suburbs massively while maintaining the fine-grained variety that feels right for Auckland. Choosing the right sites, without resorting to bulk and height, and dividing them up into small and affordable parcels, puts development in the hands of small-scale private investors. Most of the lots will be owner-occupied, while also generating an income from commercial and residential rents. At Vinegar Lane baby boomer savings are being used to build a new Auckland. Chris Moller who hosts New Zealand’s Grand Design programme called the Vinegar Lane program -’pioneers of urban farming’ in a show dedicated to following the development of one of the sites. This intensification mechanism has had a fair number of pitfalls (hence the pioneers term) -there were many delays and cost overruns in Vinegar Lane, yet the system clearly has potential to be more widely applied. I think reciprocal intensification which focuses on neighbours co-operating versus London Yimby’s proposal which focuses on streets co-operating is a reflection of the different streetscapes, histories and cultures of New Zealand versus England. London’s suburban streets are mainly made up of terraced housing, with a strong degree of uniformity. New Zealand’s suburban streets are mostly non-uniform standalone housing. The first intensification step a city should allow, in my opinion, is to use the ‘unwanted’ space between the houses on a street. 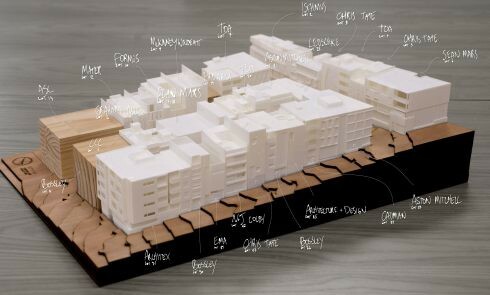 This allows a gradual evolution of residential city plots, to go from stand alone housing, to full width of the site town or terrace housing, to small apartment buildings and then to larger apartment buildings, as supply and demand for the space interact with each other. If mix-use developments are allowed, like in Japan, then a further evolution between industrial, residential and commercial developments can occur in response to changing economic conditions. This evolution can be seen in the centre of most cities -with many plots being at different stages of this evolutionary path. Due to New Zealand’s longer history of non-uniform standalone housing. I think there will be greater cultural tolerance for a ‘messy’, non-uniform approach to intensification. Something akin to what Tokyo has achieved, which I have previously written about in an article entitled “What is the secret to Tokyo’s affordable housing?”. Both mine and London Yimby’s proposal takes advantage of the fact that upzoning adds value to the properties concerned. Giving this benefit to the many not the few means the potential supply is greater. Not all property owners with developmental permission want to build on their property immediately, even without considering capital gain speculation. They may prefer their current property as it is and interfering with that might disturb a range of networks they are part of and the benefits they get from living in their current location (2). So the advantage of giving upzoning potential to the many not the few, is that the smaller subset which prefers to develop immediately is larger and competition from up-zoned land supply is greater. Greater competition means the monopolistic pricing power benefit is reduced and the supply response will be more elastic (larger quantity provided, smaller price increase). A recent empirical data study on Auckland’s planning system by economist Ryan Greenaway-McGrevy indicates increasing the intensification potential of a city by regulatory/planning rule changes may split the urban property market. Some existing landowners with newly permitted intensification rights benefit more than others from their properties increasing in monetary value. How large this benefit will be, will depend on how much competition the planning/ regulatory/ infrastructure provision system allows. I think it is reasonable to speculate that affordable housing reforms coming from allowing an urban area to build up and out will have two effects on existing homeowners. The value of existing homes may decrease over time as more competitive and affordable homes come onto the market. The second effect is that existing homeowners with property that is in desirable locations and that have the potential to take advantage of newly permitted up-zoning may find their land goes up in value ie for these properties the value is not on what is currently on the site but on what could be. The location specific and heterogeneous nature of urban property markets means even within the existing home owning cohort there will be beneficiaries from increasing the potential supply of more competitive land. This is an important point as often in housing affordability debates the dividing line is characterised as between generation rent and existing homeowners. But really the dividing line is between those with an inclusive mindset to expanding their community versus those who hold exclusionary attitudes. Proposals such as my reciprocal intensification idea and London Yimby’s proposed street by street intensification mechanism are part of a wider movement trying to create a more inclusive, equitable and affordable housing market. This constructive and positive movement is growing and gradually the best ideas for achieving its goals will be implemented. Great article as always Brendon. The new Transport, Housing and Urban Development Minister -Phil Twyford tweeted in support of this article this morning! The incentives are all wrong. Break up Auckland Council to the legacy councils, abolish land rates and councils are only funded via a slice of income tax based on how many people who live in their city. Unlike now, all councils will then have an incentive to make sure intensification will happen rapidly. Cities will compete to attract people to their region. People will actually want more neighbors because they know it will mean more money for improved services/infra for themselves. As long as councils rely on land rates alone, there is zero monetary incentive to intensify because more residents doesn’t mean more income. So nothing changes. Unimproved value rates, which only rates the land component not the building value should in theory stimulate intensification -because in effect it is a local land value tax. When National created the supercity they specifically excluded the council from using this type of rating system. Historically in NZ before the 1980/90s reforms at every local government election there was a local referendum on what rating system the council should use -many councils around NZ chose unimproved value rating systems. I think there does need to be a discussion of local government revenue sources to fund new infrastructure. I think Phil Twyford’s municipal bonds/targeted rates could help, as would congestion road pricing -as roads are a significant expense for Councils -I believe up to 50% of total expenditure for Auckland -so anything which limits this expense and provides an alternative revenue source would be helpful. I am not sure those two policy initiatives (and how long will a system of congestion road pricing take to develop?) are enough to fund the various local infrastructure deficits we have in NZ. I think we need to have a more focused conversation on this issue. Good article Brendon. Good points Ari, but you’ve both given me a new idea to propose regarding land taxes. First, Ari, councils can compete for property taxes by serving demand. If an existing council doesn’t, then a competing tax authority can, which is a useful disciplining device. The counties around Atlanta, Georgia, are property tax hungry, and all willing to serve unhappy customers of the muncipality. This makes the municipality competitive. However, that above point relates to, and faciliates, urban expansion (which greatly aids land competition). However, what’s the equivalent for encouraging urban intensification? If one council declines demand for intensification, could a closely proximate neighbouring council serve that demand and get the property taxes that result? Not if it’s a pure tax on unimproved land only, which provides the same amount of tax regardless of how intensively land is used. Although the Productivity Commission in ‘Better Urban Planning’ argues a capital tax reduces incentives to capitalise on land, it may increase the incentives to councils to enable intensification if they face competition for property taxes from closely proximate (property) tax authorities. The incentive effect cuts both ways, not just to land owners, but to land regulators. I’d never thought of it until responding to your two posts now, so thanks for the food for thought. I think the difference though with property taxes in US cities vs here is that property taxes in the US (at least where I lived) are generally an absolute percentage of the market value of the property. Whereas here the rates, while they are differential on property value relative to one another, are applied across the board to collect a certain amount of money the Council has determined it needs amongst the households it can tax. There problem is that councils in NZ aren’t competing. There is no competition. It is a take it or leave it market. They are monopolies. No one is going to move cities because their rates bills go up more than another town. They move for jobs or lifestyle or earthquakes or cheaper housing or whatever. Councils control their revenue by setting their rates to whatever the population will tolerate. There is zero financial incentive to intensify. They can just increase rates if they need more money. Homeless people don’t pay rates, so why would council have any urgency to intensify or try and create cheaper housing? If some land fits 2 people or 50 people, it doesn’t change council revenue at all. It is irrelevant how many people fit in the city. It may change the bill to that property owner via the value of the property, but it doesnt matter at all to council because they are raising a set amount of money. So the councils operate like monopolies and the incentives lead to doing nothing but the status quo. If council revenue were entirely dependent on how many people were in there boundries, everything in council would be working towards fitting in as many people as possible. We don’t have that, so we get a housing crisis. Germany/Switzerland does have something like that and they have far lower housing costs in proportion to income. A key part of the competition for land taxes that differs between here and the US is the territorial jurisdiction of their municipalities. It varies by state and municipal population, but in the affordable growing states their territorial and extra-territorial jurisdiction is largely defined by their urban extent. Agree people won’t shift homes for tax advantages, but developers will shift where they invest based on cost and responsiveness of local alternative municipalities, counties. The mistaken mindset people have of councils here is they collect their pound of flesh by decree. That’s because they’re monopolists that have territorial jurisdiction over vast rural areas beyond their urban extent. But if a neighbouring borough council could enter the market and cut their lunch, they’d no longer take their property taxes for granted. They’d need to fight hard for them. This dynamic changed tremendously in 1989 when the number of local authorities was slashed by 90%. Before then, councils were squashed up against each other, with constrained territorial control to each. The other important thing they have is county governments that duplicate what municipalities do, which fosters competition. Our regional councils are in unrelated markets to our territorial authorities by design, to minimise duplication of cost, but it exacerbates monopoly power. Not in terms of high price-cost mark-ups, but in terms of the Model-T Ford problem ‘you can have any colour you like, as long as it’s black’. Do you think the trend towards less restrictive zoning is justified in all NZ cities/towns, or just some? Auckland/Welli/Chch seem to all be trying to make their planning rules less prescriptive. But I also know some towns (namely Queenstown) are moving in the other direction, trying to introduce more restrictive planning rules to try and preserve the look and feel of the town. Aspen in the USA has extremely restrictive planning rules, which is being looked at as an example – are you aware of them at all and do you think intentionally capping/slowing growth is a justifiable viewpoint? Building regulations and zoning requirements used to be about important important matters -such as saving lives by minimising the spread of fire, disease etc. So of course there is some building restrictions which are absolutely worth it. If NZ goes into a period of removing restrictive building rules -lets do it with our eyes open and in a non-puritanical way -that way costs and benefits can be addressed properly. I have some more posts which Greater Auckland have agreed to publish that touches on these issues -perhaps though it will need even more discussion/clarity? On the question of local zoning. I think the evidence is that simple zoning systems applied nationally like in Japan, which limit local restrictive choices are better. This website often frames accommodating growth as a moral decision, that we ought to do to prevent people having to live in cars and the like. I just wondered if you think there are any situations where it’s better to intentionally not accommodate growth, acknowledging that it will disadvantage some people but still doing it anyway, like they are in Aspen. The Aspen mayor’s comments are just pure NIMBYism. Queenstown will languish if it tries to preserve itself in amber – like many Auckland suburbs are trying to do. Change is inevitable and should be embraced while obviously trying to mitigate the true negative effects. But change in itself is not a negative effect. Death is inevitable too. I’m not planning to embrace it. There are many towns, cities and suburbs throughout the world that only thrive because they have preserved themselves in amber. If only they had had dynamic town planners Chester, York and Berwick would no longer have those nasty Roman walls that clog the flow of traffic. Venice would have those canals filled in and decent tarmac laid. Think of Prague with all those old buildings in the way of modern development. Sometimes it is hard to know what has been lost – all those photos of St Pauls cathedral on postcards still being sold but the view destroyed 50 years ago by an office block. I lived in Walthamstow for a decade before realising the drabbest of shopping arcades had replaced the magnificent Palace Theatre about twenty years earlier. Seriously it is all a matter of judgement and common sense and challenging the ‘experts’. And Rome wouldn’t have St Paul’s, London wouldn’t have St Pancreas. The point being that nothing should be saved exactly as is. Never been to Rome – what is or was St Pauls? And it is St Pancras railway station – still a wonderful building. Not quite understanding the point you are making. Do you want repairs or do you mean putting graffiti on the Taj Mahal or do you mean adding flushing toilets and electricity to Westminster Abbey? Clearly some things are worth preserving and for many of them preservation will result in ‘changing’ by humans. But all – isn’t that change out of spite? Bob, I think you misunderstand how these cities in Europe work. Prague wasn’t preserved in amber. Like most cities it gradually grew and evolved to its current form. If you’re walking around in the medieval city centre you’ll see buildings dating from the Middle Ages, modern buildings, and everything in between. And yes that city centre is now protected. But this city centre occupies only a small speck in the total urban area in Prague. Walk a few kilometres, and you’ll see a much more mundane mix of modern and older buildings. In Auckland, the equivalent thing would be to “preserve” an area the size of the CBD. And those old houses around it… They’d be replaced with something more substantial. Perhaps not unlike the buildings you’d see in Prague a few km from the city centre. My point is that there was *something* at St Paul’s and St Pancras (bloody autocorrect). We would have never built them if we had preserved the city in Amber. The question is *what* to protect, not *how* to protect everything. Yes, change is inevitable, but we have a choice as to what we want to change to. I’ve been having the same argument with a particularly dense developer here in Wellington – who says that as the height limit here permits 9 story buildings, therefore we must indeed always aim for 9 story buildings – or taller – rather than consider everything on its merits. We are already tainted with a series of abysmal 9 story residential stumpy towers here in Te Aro, of minimal or zero aesthetic appeal and which do little to give back to the neighbourhood. The Council does not just need to say a blanket “Yes” to all proposals – it can and it should advocate for better quality design everywhere, and both encourage taller buildings in some areas, and not permit some tall buildings in some other areas. I guess that is like Queenstown council mandating that all restaurants must serve caviar and truffles. We are so scared of the free market when it comes to housing even though it does so well in almost every other facet of life. Excellent article Brendan, thoughtful and well written, with good examples. 2) Remove the ability to have covenants on land which limit the ability to develop. Existing covenants should expire in 5-10 years. 5) Move to a national “effects based system” (objective measures of sunlight, noise, wind-tunnel, smell, etc etc (maybe amenity)). Yes it will take awhile and lot of discussion about defining the effects but I’m sure it can be done. 6) Remove the ability to tax on capital value or improved value & Introduce a land tax (no more land bankers) at the local level as the general rates component (may have service components as well). At the national level there may also be an additional land tax replacing other forms of tax. My one concern is suggest we don’t overlook the benefit to a set of people collectively binding their hands for mutual benefit. Developers add covenants (to commonly-owned land before resale) to tailor to particular market segments and maximise benefits to those land owners. However, I like the approach common in the US which is for a mandatory sunset clause to expire after, say, 20 years. They typically use a Homeowner Association to administer and enforce the covenants, and they have to vote to reinstate it for another fixed period. Also, their law mandates majority (or modest supermajority) to change covenants. In contrast, covenants have minimal regulation in NZ, and certainly don’t have the above requirements. This needs to change when we fix the rest of the supply system. Personally I think the concept of a land tax is a bit unfair considering how restricted land owners have been (and still are). Going from “you can’t develop it” to “we’ll tax the crap out of you because you haven’t developed it” in a small time frame seems crazy unfair. a public park of at least 10% of the land area. Too hard? Could Council try something along those lines and then modify it if no-one jumps at the opportunity? Isn’t this like having a rule that every household can only bake one loaf of bread a week unless they get together with their neighbors and bake? The problem is that we don’t have enough dwellings because the council prevents people from building them. The solution is to prevent the council from preventing people from building them. In the text written by Evans in my reference section there is a section on voluntary land reallocation in Europe. Historically peasant land holdings were often odd shaped blocks -maybe a strip for growing wheat here, a row for apple trees there and so on. Many rural communities in places like Denmark voluntarily came together and reallocated the land in more uniformed shaped blocks with good access to roads etc, more suited for modern farming. I wonder if Auckland would benefit from doing a similar concept in places where urban intensification is in demand. What if better, more valuable smaller ‘perimeter blocks’, could be devised if section shapes/sizes were changed. What if more laneways were created as part of this, which made the neighbourhood more porous for active transport modes and helped accessing PT (increasing catchment area). That would benefit the existing landowners and the wider neighbourhood. Maybe the Council would contribute some capital for such group intensification projects if it created beneficial new public right-of-way laneways? Maybe this concept could help rectify existing low % road/intersection suburbia that are very car centric, which are quite prevalent in Auckland. It would be difficult to organise -but maybe in some places some groups of neighbours would be interested? If that could be arranged the benefits could be quite significant. Yes, more laneways are required, and there is no incentive currently. Key thing is home ownership percentage. If home ownership drops below 50%, the tipping point is reached and voter will vote for government that will make house more affordable though intensification. On the other hand, high ownership ratio will reinforce status of quo – maximum capital gain for retirement and biggest backyard. Brendon: an interesting and persuasive post. I like your idea of an approach that is both more democratic and more tuned to local needs. It certainly would depend on how sympathetically it is implemented – the devil might be in the details. Last year the UP hit our suburb. I think I can replace my one storey with a three storey house but at a certain point up the road that changes arbitrarily from 3 to 6 storey which must have altered property values arbitrarily too. Speaking to an experienced surveyor with over 30 years of local experience he said about Auckland’s consent process ‘now we can never predict what they will approve or what objections they will create’. He then mentioned 7 units being built on a small Northcote site with no provision for parking and said they were stunned, nobody in his office ever expected it to be approved. When a bureaucracy becomes unpredictable and slow you are descending into third world governance. Fortunately NZ has a strong tradition of honest, incorruptible administration but there may be a danger that the reputation will be lost however undeservedly if the rules are not clear and implementation brisk. Do you think a computer app could be designed to guide the public through the consent process (stopping you proposing things that will be rejected); the Dept of Immigration does something similar with its online Visa guides. I can fix this problem for you – how about you never even need to tell the council what you intend to develop? What if you could develop whatever you want assuming there is someone prepared to buy it? Bob, the council offers a free sit down with a consents planner to discuss any idea or development plan you might have. They’ll tell you straight away if it complies or not or what you might have to change or design in more detail. This service is open to anyone and they actually request that you do it before spending money on an architect or planner to do any detailed work. Thanks Nick. I have no plans to become a developer – quite happy where I live even if my house is rather dilapidated. But you are right about the consents planner. I had an old garage which was falling down because its foundations were moving leaving wide cracks in the concrete floor. I went to Takapuna and a very helpful planner explained to me that knocking it down and replacing with identical (it was an old ‘Skyline’ garage) would need consent and an initial charge of $2000. She was not able to assure me that consent would be approved (otherwise presumably that would invalidate the consent process). Helpful and friendly but that could have been on an intelligent website and saved me the bus journey. It left me with a toss up – to make a repair or knock it down and I chose the latter and park in the open. I certainly see why most development is done by professionals – it is all a minefield for simple home owners. JimboJones: I was told this is what happened in Waiheke and their properties look good. Would it work in areas of poverty – I’m not so sure? The people who are renting garages and damp houses to poor families would just construct more garages. You can check out the slums in the UK which developed until the 1947 Town and Country Act stopped them. What if we changed the planning rules so it was really achievable/easy to upgrade dodgy garages used for slum housing to real houses with proper insulation, heating, ventilation bathrooms, cooking facilities……. ? What if it wasn’t dodgy garages, sheds and cars etc that is the cheap option for residential space? What if there was other choices? What if there were a large number of spaces available in our cities competing to make room for the young, poor and vulnerable parts of our society? What if life for garage, shed and car dwellers had more carrots and less sticks? What if governance institutions had more of a ‘can-do’ and less of a ‘can’t-do’ attitude? Bob the UK has been a disaster wrt housing for 70 years. There is very little to learn from the old country -except what not to do. Check out the uniquely British disasters in the following article. Hi Brendon, I lived for many of those 70 years in the UK – the 1950’s state house in a small town was great. It still exists and would be quite acceptable to any family today. The housing before ’47 was frequently dreadful – remember when the war broke out and universal conscription produced many UK young men who simply failed their conscription due to poor health – some of that was simply poor diet but it was also really bad slum housing. There were good reasons for knocking down most of the housing in British cities – what replaced them was not particularly good (properties that the architects, builders, town planners and councilors built but did not live in – we have similar in some CBD apartment blocks). I agreed with your post and would like to see your ideas come to fruition. Certainly worth giving it a try but some of your supporters have the enthusiasm of revolutionaries. In revolutions they throw the baby out with the bathwater – Pike River shows how removal of ‘unnecessary regulations’ for political reasons can lead to disaster. Concur with your ‘can-do’ concept. That would not only remove a serious drag on much needed development but also remove my worry about the perception of corruption. With our multi-ethnic Auckland society there are already tales of wealthy foreigners thinking that consent restrictions are the harbingers of the corruption they have experienced in other countries. A pragmatic rather puritanical approach is probably the best. To quote you from your link “” the devil is often in the detail “”. 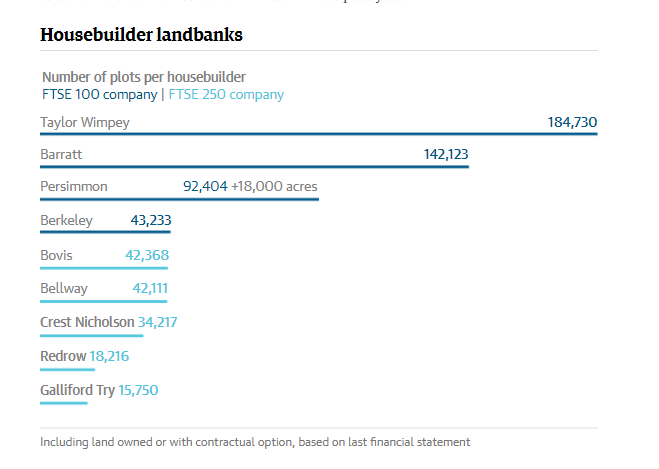 In the UK local councils have often been dominated by interested parties – builders for example. The value of this website is the public comment – some very well informed – that is mainly interested in housing and infrastructure for no other reason than curiousity and hoping to leave things better than they find them. Bob: you need to hire a maintenance person, rather than build a new garage and pay the Council $2000. Under NZ law, you are perfectly entitled to undertake “maintenance” to your building, and replace materials, like for like, on any existing building, without a building consent. So, gradually, you can replace each piece of the building, in turn, and have a new building over time, the same as the old one, but in much better condition. “” urban development frameworks are only benefiting the few and are detrimental to both the poor and the middle class “”. In Auckland the middle class is split into two – not upper and lower but home owners and renters. I’m a home owner but my eldest daughter is more middle class than myself but unlikely to ever own her own house in Auckland (unless I disinherit the other five kids). I think that is the norm in many places overseas. My parents would have taken this for granted. It’s maybe more interesting to think of this the other way around: why is this not the norm over here? Why is it that most houses in Auckland have to be developed in bunches by large developers? This seems counter-intuitive, there are a lot of people with the budget to ‘develop’ one house (basically anyone looking to buy a new house), while the amount of developers who can develop 100 houses at once would be rather limited. Developers also have different incentives (build as cheap as possible vs. make sure the house is actually fit for purpose), and if a developer keels over, you have a big patch of 100 developments in limbo. What are the advantages? +1. Developers can and do keel over leaving disgruntled owners nobody to sue. I would say the norm internationally is actually large scale combined developments. There are huge savings from developing in bunches. All the works get economies of scale. Most earthmoving companies won’t bother with a single site, it’s not worth the time for them to relocate all their equipment and set up shop. Doing it for 50 or 200 sites however they will. Same with everything else, site offices, delivery of materials, subcontractors. Try and get a plumber in to plumb one house and make one set of water, sewer and gas connections…. or hire a plumbing company to work on site full time for six months to do 200 houses. I thought most plumbing companies over here consist of one person and a van. Same with electricians. Do they get a lot of economics of scale from wiring / plumbing 100 houses at once? Imagine you want to move house. You could argue a shipping company is not going to bother with shipping the contents of just one single house. But actually you can hire a couple of guys with a small truck who will do exactly that. Similarly if you want to do some earthworks for your house, I’m sure you can hire someone with a backhoe to get the job done. And even if large scale developments are popular over here, that doesn’t make it a good idea. From Brendon’s posts about Christchurch it does not appear to be working out very well over there. Yes especially for one person and a van. They can set up on site and work for eight hours a day, every day for months. Rather than do a half hour job, drive an hour to the next place, do a three hour job, spend another hour driving to the supplier to collect a part, drive it over to the next client, find out that person isn’t home, drive over to the next thing but realise the traffic is to thick, turn around and call the first person again, etc. etc. With you’re house moving example, it’s perfect. Work out the cost to move a quarter tonne of furniture with two guys and a van from Auckland to Wellington. Then work out the cost to move say 100 tonnes of furniture with a shipping company from Auckland to Wellington. The cost per unit would be an order of magnitude higher per tonne to do it with the small scale option. Again likewise with one guy and a back hoe. He might take a week to level your site. Whereas a gang with a digger and grader could level 100 sites in the same time, at a fraction of the cost per site. That makes sense — but it’s not an option for the many. How many players are large enough to get those big developments going? On my ride into work I passed a site on our street, 2 houses going in, still at the framing stage this meant 12 vehicles for the 12 workers on site. Builders’ vehicle numbers and parking styles is a subject all to itself! I have empathy for the difficulty of getting access to a building site. I suspect the rules don’t meet the builders’ needs so enforcement evaporates, with the result that all too often pedestrians and cyclists don’t have safe passage past. A better system needs to be set up, and then enforced. Thanks Heidi- yes “back in my day” as a labourer I cycled to the firm’s yard and we loaded up and went to the site – nowadays even labourers are being asked to be owner businesses with all the added costs of gear, transport, insurances etc etc. Owning two adjacent properties each with a house on it I paid almost $20,000 just to transfer a chunk of undeveloped steep slope from one property to the other. So if / when we sell the larger property will appeal to developers who could subdivide (zoning was 450sm and now 400sm). With your land tax I would have to move the chunk back. This is all a pain – I still can’t see why it costs so much to change a line between two properties. As I said I’m not a developer; with our current rating system having a full section instead of a half section (using traditional definition of a section) I’m paying about $1000 per year to have a large garden. That seems about OK.
Obviously I have made a bet on the change improving value – my $20,000 and my risk. Relevant to your topic it leaves developers with a problem – they pay up front all the costs with a hope of making a profit when they have built and as we know if things go wrong they declare bankrupt or go abroad and on the other hand if successful quite rationally set high prices so they can make big profit. There is little of the capitalism at work that makes by local baker produce cheap loaves. To encourage small developments council consent charges should be attached to the LIM and paid when the property changes hands (or to stop developers keeping units as rentals when first inhabited) and the charges should be related to the selling price because it seems that a really small consent like my boundary change would be much the same cost if it had effected 3,000sm instead of the 300sm. The other half of the cost was the councils requirement for a full old fashioned millimetre scale survey – surely with modern GPS equipment and with the same owner both sides it should have cost hundreds not thousands. Simply reviewing all the council requirements and charges would make sense. However I don’t agree with some contributors who are asking for the removal of all rules – for example on my boundary change the council required proof that the drainage was to latest modern standard – here I think they were quite right a point emphasised by the recent landslip in nearby Birkenhead.